This view of Interstate 80 west is taken between Exits 49 (Clive) and 41 (Knolls). 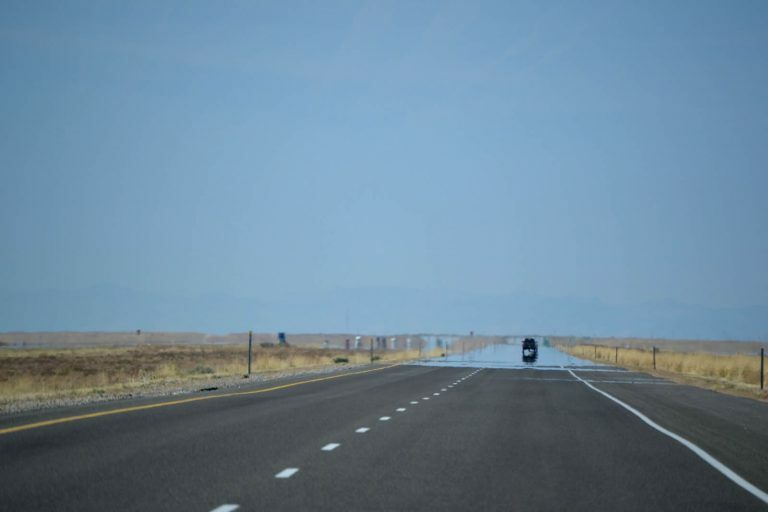 Vast empty lands abound in all directions as the freeway prepares to cross the Great Salt Lake Desert. Photo taken 10/28/11 by Garrett Smith. Interstate 80 descends from the Cedar Mountains area toward the Great Salt Lake Desert, a vast expanse of salt flats. Photo taken 07/03/16. The unpopulated settlement of Knolls lies 20 miles to the west while the next array of services remain 61 miles away in Wendover. Photo taken 07/03/16. Water from the surrounding mountains will drain into the Great Salt Lake Desert, eventually evaporating or flowing into a sink or dry lake bed. Photo taken 07/03/16. A diamond interchange (Exit 56) joins Interstate 80 with Aragonite Road to the south of the low rise Grassy Mountains in one mile. Photo taken 07/03/16. Old U.S. 40 follows I-80 Frontage Road along the north side of Interstate 80 from milepost 58 to Exit 41. Exit 56 links the freeway with the parallel road, Gravel Site Road north to the Grassy Mountains and Aragonite Frontage Road west as well. Photo taken 07/03/16. Aragonite is a Union Pacific Railroad siding located 3.1 miles to the southwest of Exit 56 at Hastings Pass Road. Hastings Pass Road meanders east across the Cedar Mountains to Skull Valley. Photo taken 07/03/16. The Grassy Mountain Rest Area comes after the Aragonite interchange along I-80 westbound. Photo taken 07/03/16. 7,650 vehicles per day (vpd) were recorded by UDOT on the 6.6 mile stretch between Aragonite and Clive in 2014. Photo taken 07/03/16. Located at milepost 54, the Grassy Mountain Rest Area can accommodate 24 cars and 15 trucks or RVs. Photo taken 07/03/16. Interstate 80 lowers over 300 feet in elevation across Ripple Valley on the 12-mile drive to Knolls. The faint mountain range on the horizon is apart of the Goshute Mountains in Nevada. Photo taken 07/03/16. Interstate 80 continues west one mile to the diamond interchange (Exit 49) with Clive Road. Photo taken 07/03/16. Clive Road travels north from Exit 49 to remote areas of Ripple Valley. South from I-80, the paved road extends to Clive Complex Road by a radioactive waste storage facility.1 Photo taken 07/03/16. Exit 49 leaves I-80 west for Clive, a Union Pacific Railroad siding three miles to the south. I-80 Frontage Road (former U.S. 40) remains to the immediate north as the freeway passes south of the Grayback Hills. Photo taken 07/03/16. A long straight away takes Interstate 80 west across mud flats preceding the settlement of Knolls. Photo taken 07/03/16. Reno reappears on westbound mileage sign at 453 miles out. Wendover and the next traveler services are another 47 miles across the Great Salt Lake Desert. Photo taken 07/03/16. UDOT installed signs along remote stretches of Interstate highway in an effort to raise awareness of driver fatigue. Following actions by state officials, signs began appearing in areas known for crashes involving drowsy drivers in 2004.2 Photo taken 10/28/11. Interstate 80 bee lines west to Bonneville Speedway with very little variation to break the monotony. The upcoming Knolls exit is the last stopping point off the freeway until the Salt Flats Rest Area at milepost 10. Photo taken 10/28/11. Fatigued driver signs along I-80 in Tooele County were installed by summer 2004. 14 fatalities in the county were attributed to driver fatigue during the previous year.2 Photo taken 07/03/16. Interstate 80 advances west one mile to Exit 41 for Knolls. Knolls is a Union Pacific Railroad siding and off-roadding site 1.7 miles to the west on Old Highway 40. Photo taken 07/03/16. The sage brush and other vegetation gives way to salt flats west of the upcoming diamond interchange (Exit 41) with Old Highway 40. Photo taken 07/03/16. Exit 41 parts ways with Interstate 80 west for Old Highway 40 west. Old Highway 40 parallels the south side of the freeway from here to Blair and Exit 4. Travelers are advised to use the road at their own risk as it is not maintained. Photo taken 07/03/16. I-80 Frontage Road follows old U.S. 40 east back toward the Grayback Hills. The original U.S. 40 alignment was displaced by construction of I-80 between Exit 41 and Knolls. Photo taken 07/03/16. The white sands of Great Salt Lake spread to the northern horizon, which is anchored by the distant Newfoundland Mountains. Photo taken 07/03/16. Interstate 80 plies across the Great Salt Lake Desert and vastly empty Bonneville Salt Flats west from Knolls. The initial stretch is over 4,220 feet above sea level. Photo taken 09/08/05. Wendover lies 30 miles ahead at the Nevada state line. Together with West Wendover, the two cities are home to over 5,000. Reno is another 400 miles across the Silver State. Photo taken 09/08/05. The 87 foot tall, Metaphor: The Tree of Utah sculpture appears along the north side of Interstate 80 at milepost 26. Photo taken 09/08/05. Created between 1982-86 by European artist Karl Momen, Metaphor: The Tree of Utah features several "fruits" protruding from its branches. The fruits, painted spheres essentially, represent "color, circles, and cosmic space in a personal hymn to the universe." Photo taken 09/08/05. Several broken spheres on the ground represent "fruit" that have fallen from the tree. Unfortunately for prospective visitors, there is no access to the sculpture and the I-80 shoulder is reserved for emergency parking only. Photo taken 09/08/05. The Silver Island Mountains rise to the northwest of Bonneville Salt Flats International Speedway. Beyond there is the Pilot Range along the state line. Photo taken 09/08/05. A second mileage sign posted between Exits 41 and 4 shows ten miles of progress since the last installation. Elko reappears here at 130 miles out. Photo taken 09/08/05. The salt flats extend to the Newfoundland Evaporation Basin east of the distant Silver and Floating Islands. Photo taken 09/08/05. The Silver Island Mountains extend northeast from Leppy Pass. Graham Peak tops out at 6,680 feet toward the north end. Photo taken 09/08/05. Areas to the north where the Bonneville Salt Flats continue to the horizon reveal the curvature of the earth. Photo taken 09/08/05. Pilot Peak (el. 10,614 ft) punctuates the adjacent mountain chain in Elko County, Nevada. Photo taken 09/08/05. Looking to the northeast, the Newfoundland Mountains remain in view. Photo taken 09/08/05. The Salt Flats Rest Area offers a respite to weary travelers at milepost 10 on Interstate 80 westbound. Photo taken 09/08/05. This rest facility provides 34 car stalls and nine truck/RV stalls. Photo taken 09/08/05. Reassurance marker posted as I-80 passes to the south of Bonneville Salt Flats State Park. Photo taken 10/28/11. Travelers along I-80 reach Wendover in nine miles. Beyond West Wendover, I-80 turns northwest ahead of the distant Toano Range on the 415-mile trek to Reno, Nevada. Photo taken 09/08/05. The longest exit less stretch along transcontinental Interstate 80 comes to an end at forthcoming Exit 4 with Bonneville Speedway Road. Photo taken 10/28/11. Bonneville Speedway Road stems north from adjacent Old Highway 40 near the railroad siding of Blair, 1.6 miles to Leppy Pass Road. Leppy Pass Road branches northwest to Leppy Pass across the Silver Island Mountains. Photo taken 10/28/11. Entering the diamond interchange (Exit 4) on Interstate 80 westbound. Bonneville Speedway spurs northeast to Bonneville Salt Flats International Speedway. The track stretches northeast typically between 10 and 12 miles depending upon the condition of the salt surface. Numerous land speed records were set at the speedway. Photo taken 10/28/11. Ports of entry operate in both directions of Interstate 80 midway between Exits 4 and 2 outside Wendover. Photo taken 10/28/11. All commercial trucks must use the right lane for weigh in motion sensors at the Wendover Port of Entry or exit into the facility along side buses and vehicles with livestock. Photo taken 10/28/11. A sweeping off-ramp (Exit 2) follows the port of entry for Business Loop I-80 & Utah 58 west into Wendover. Photo taken 10/28/11. Utah 58 and Business Loop I-80 overtake old U.S. 40 along a 1.36 mile route to the Nevada state line. Casinos line the business loop as it continues west along Wendover Boulevard (former Nevada 224 and old U.S. 40) through West Wendover. Photo taken 10/28/11. The partial trumpet interchange (Exit 2) with SR 58 is the first of four interchanges serving the Wendover-West Wendover area. U.S. 93 Alternate joins Business Loop I-80 (Wendover Boulevard) in Nevada before the route returns to Interstate 80 at Exit 410. Photo taken 10/28/11. Wendover Peak (el. 5,046 ft) overlooks the city of Wendover from the north as I-80 shifts southward to circumvent the adjacent mountains. Photo taken 10/28/11. A new half diamond interchange (Exit 1) opened in 2008 between Interstate 80 west and Aria Boulevard in Wendover. This exit provides direct access to the Montego Bay Casino & Resort and Wendover Nugget Hotel & Casino just across the state line. Photo taken 10/28/11. U.S. 93 Alternate and Business Loop I-80 meet Interstate 80 three quarters of a mile west of the state line at Exit 410. The bannered US highway heads southwest from West Wendover 59 miles to U.S. 93 at Lages Station, northeast of Ely. This route was formerly a part of U.S. 50 Alternate until 1976. Lincoln Highway enthusiasts can depart here to rejoin the highway at Ely and take U.S. 50 across the Silver State of Nevada. Photo taken 10/28/11. Exit 1 departs from I-80 west for Aria Boulevard south to Business Loop I-80 & Utah 58 (East Wendover Boulevard) at 1st Street. Future plans involve upgrading Exit 1 to a full diamond interchange. Photo taken 10/28/11. Interstate 80 crosses into the Silver State of Nevada and the city of West Wendover. Although most of Nevada is in Pacific Time, West Wendover remains in Mountain Time. Upon leaving West Wendover, westbound motorists enter the Pacific Time Zone. West Wendover successfully lobbied to join the Mountain Time Zone to strengthen its economic ties with Utah in October 1999. Like many border communities elsewhere in Nevada, one of the principal draws to West Wendover are the casinos. Photo taken 09/08/05. "UDOT installing anti-sleepy-driver signs." Deseret Morning News, June 3, 2004.